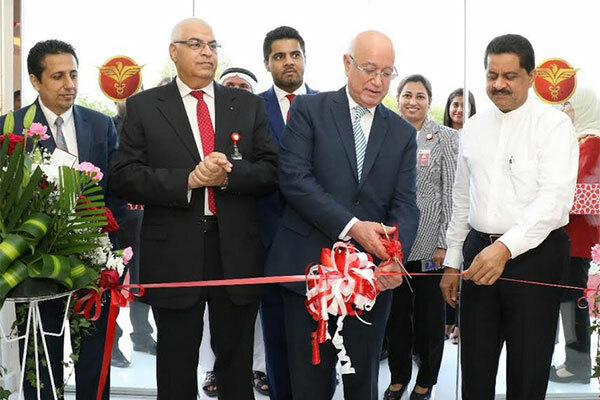 Thumbay Dental Hospital, the first private dental hospital in the UAE and the largest academic dental hospital in the Middle East region’s private sector, opened yesterday (April 10) at Thumbay Medicity, Al Jurf, Ajman. Prof Hossam Hamdy, chancellor of Gulf Medical University was the chief guest of the inaugural function, presided by Dr Thumbay Moideen, founder president of Thumbay Group. Also present at the function were Akbar Moideen Thumbay – vice president of Thumbay Group’s Healthcare Division and members of the Thumbay Group Board. With a built-up area of 37,000 sq ft and 60 dental chairs spread across three floors, Thumbay Dental Hospital has a competent team of experienced and qualified dental specialists, delivering high quality dental services to patients at affordable costs. The hospital has cutting-edge technology, providing personalized care according to the needs of individual patients. The hospital is staffed by a team of caregivers from 25 different nationalities, capable of serving patients in 50 different languages. The hospital also trains the students of the undergraduate and proposed post-graduate courses of the College of Dentistry, Gulf Medical University (GMU). Being an academic hospital, the doctors here are also academicians with extensive knowledge, keeping up-to-date with the latest technology and knowledge of research breakthroughs in dentistry. The hospital offers services and treatments in general dentistry, endodontics, paedodontics, periodontics, invisalign, veneers & lumineers, dentures, crowns and bridges, simple & complicated extractions and Hollywood Smile. Specialized services also include implants, orthodontics, lasers & endodontic microscopes, cosmetic dentistry, treatment for facial pain, complicated oral surgeries and sleep apnea. The hospital has an in-house dental lab for accurate dental prosthesis. It also features dedicated CSSD for infection control. The hospital is also open on Fridays. Thumbay Dental Hospital is a member of the Gulf Medical University Academic Healthcare System, providing continuous professional growth for doctors, for innovative dental treatments. Thumbay Dental Hospital is located at the Thumbay Medicity, in Al Jurf, Ajman which also houses the region’s leading private medical university – the Gulf Medical University. A 500-bed academic hospital - the largest private academic hospital in the region, as well as an advanced rehabilitation centre – the first-of-its-kind in the region, are at the final stages of completion at Thumbay Medicity, slated to open shortly. Thumbay Medicity also houses Body & Soul Health Club and Spa, The Terrace Restaurant, Blends & Brews Coffee Shoppe etc. According to Dr Thumbay Moideen, the ongoing and upcoming projects at various locations in the UAE as well as elsewhere in the GCC, Africa and India are in accordance with the group’s strategic plans, which will scale up the size of the businesses at least ten times establishing global presence and increasing the employee strength to over 25,000, in the next 4-5 years. “The Thumbay academic hospital network will have a total of 1000 beds in the UAE, 1500 beds in India and 750 beds elsewhere in the Gulf and Africa by 2022, in addition to upcoming clinics, day care hospitals, labs and pharmacies at various locations,” he said.